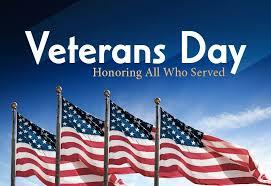 Veterans Day—November 11— is a day to honor those who have served in the armed services of our great nation. Originally known as Armistice Day, our Congress commemorated this day to celebrate the “cessation of the most destructive, sanguinary, and far reaching war in human annals” as World War I finally came to an end on November 11, 1918. It was called “The War to End All Wars”… but it didn’t. World War II followed all too soon and more than 16 million men and women of America’s Greatest Generation answered the call to fight for the preservation of our freedom. More than 70 years have passed since the ending of that war. Of the millions who served, scarcely a half million are still with us. And they are dying at the rate of 372 each day. They won’t be with us much longer and that makes it all the more imperative that we take the time to honor them and preserve their memories. The Korean Conflict followed and on its heels came Viet Nam. Veterans of these wars rarely received the recognition and honor that was given to the veterans of World War II. Then came the Cold War, the Persian Gulf War and now the Global War on Terrorism—which is now the longest sustained conflict in our nation’s history. Today, Americans hold our all-volunteer armed services in very high regard, approving of their great contribution to society’s well-being and the preservation of our freedoms. Nearly 4 out of 5 Americans hold this view, placing the military at the very top of the list of 10 occupational groups. This recognition has brought some belated expressions of appreciation for veterans of Korea and Viet Nam, along with their modern day counterparts. How do we as individuals show honor to these men and women who have served and sacrificed so much for our freedom? It starts with a simple “thank you.” When you see a veteran, look him or her in the eye, firmly shake hands and say “thank you.” In most cases, you’ll get a “thank you” in reply, or “you’re welcome.” Others might reply “it was an honor to serve.” Your expressed appreciation means a lot and is welcomed. But there’s more you can do. Seek out ways to engage the military and veteran’s communities in meaningful ways. Support actions and programs that follow through on the promises that were made to veterans when they entered into service. Write to your members of Congress, encouraging them to approve funding and services for our veterans. There has been some recent improvement in the care and services provided by the Veterans Administration, but there is still plenty of room for improvement. Take time to read the Constitution of the United States. You can Google it—it’s not hard to find. Every military member took an oath to support and defend it. Shouldn’t you know what it says? The Founding Fathers of our nation put a lot of thought into it— and it has served our nation well for more than 240 years! Then, vote for candidates who will also support and defend it. There can be no better thanks than that. Did you know that Patriot Hospice offers a pinning ceremony to honor veterans? Veterans, or their families, may request this ceremony. Each veteran honored this way receives a pin for their branch of service as well as a certificate that recognizes their service and sacrifice to our nation. If you are interested in more information about this ceremony, please contact us. At Patriot Hospice, we honor veterans every day of the year through the services and programs we offer. It’s simply our way of repaying them for all the sacrifices they have made in the military services of our nation.